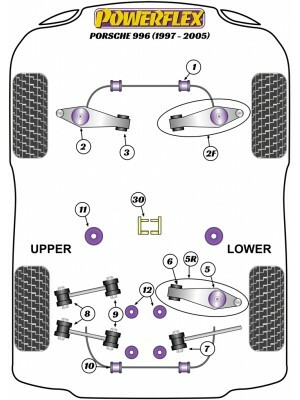 Front inner track control arm inner bush (diagram position 3) can be replaced with either PFF57-503 non-adjustable or PFF57-801 which gives on-car camber adjustment. PFR57-531 fits 996 & 997 vehicles with the twin gearbox mounting bracket (OEM part number 99737503303) at the end of the gearbox, as fitted to all 3.6 & 3.8 Tiptronic models, Turbo models Manual & Tiptronic, GT2 & GT3. For vehicles with a single gearbox bush (OEM part number 99637505505) in the end casing use PFR57-530, including all 3.4 models, 3.6 & 3.8 Manual models except for Turbo GT2 & GT3 models.